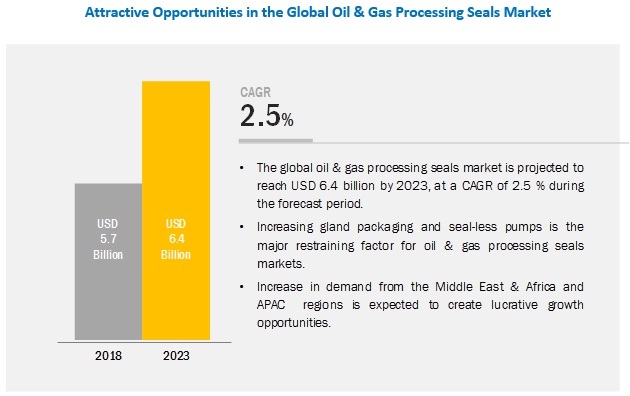 [115 Pages Report] The global oil & gas processing seals market is estimated to be USD 5.7 billion in 2018 and is projected to reach USD 6.4 billion by 2023, at a CAGR of 2.5 % during the same period. The increased production of shale gas in developing and developed countries is expected to drive the oil & gas processing seals market. By type, double seal is expected to be the largest contributor to the oil & gas processing seals market during the forecast period. The growth of the segment is mainly attributed to the increased use of oil & gas processing seals because of their ability to sustain high pressure and temperature. These seals are designed for both static and dynamic applications. The distortion of the double seal helps in preventing the leakage, thus creating a seal.The above-mentioned factors are responsible for driving the demand for oil & gas processing seals during the forecast period. By material, the metals segment is expected to be the largest contributor to the oil & gas processing seals market during the forecast period. Metal-based oil & gas processing seals are used for high-temperature applications. Metal-based seals eliminate permeation problems and can handle an extremely wide range of temperatures and pressures. These are used in extreme environmental conditions to provide protection against corrosion, cryogenic conditions, chemical resistance, and radiation. The above-mentioned factors will drive the market during the forecast period. By application, the downstream segment is projected to be the largest contributor to the oil & gas processing seals market during the forecast period. The downstream segment is projected to lead the oil & gas processing seals market, the growth in this segment is attributed to increasing usage of seals in the refining of crude oil and the processing & purifying of natural gas at oil refineries and petrochemical plants. Furthermore, it helps in marketing and distribution of products. These services help in making crude oil into various usable products such as gasoline, fuel oils, and petroleum-based products. Asia Pacific is expected to fastest-growing market during the forecast period. The oil & gas processing seals market has been studied for Asia Pacific, North America, Europe, South America, and the Middle East & Africa. The Asia Pacific oil & gas processing seals market is projected to register the highest CAGR during the forecast period, in terms of value. The Middle East & Africa accounted for the largest market share during the forecast period in terms of value. The downstream application is expected to dominate the oil & gas processing seals market during the forecast period due to the increase in the number of manufacturing facilities and technological advancement in this region. This creates an immense opportunity for the consumption of oil & gas processing seals in the region. Companies such as Freudenberg Group (Germany), John Crane (US), Flowserve Corporation (US), Parker Hannifin Corp (US), Solenis (US), Saint-Gobain (France), Trelleborg AB (Sweden), DuPont (US), Precision Polymer Engineering (UK), M. Barnwell Services Limited (UK), and Techno AD Ltd (Israel) are the leading players in the oil & gas processing seals market, globally. Diversified product portfolio, high depth in application reach, and technical assistance to customers are factors responsible for strengthening the position of these companies in the oil & gas processing seals market. They have also been adopting various organic growth strategies such as expansion and new product launch to enhance their current position in the oil & gas processing seals market. In December 2015, Dupont launched Kalrez Spectrum 6380 perfluoroelastomer seal that offers high resistance to oxidizers and amines in gas sweetening process in the oil & gas industry. The company aims to protect metal equipment for corrosion and wear & tear and increase the reliability. Which are the future revenue pockets in the oil & gas processing seals market? Which key developments are expected to have a high impact on the oil & gas processing seals market? Which product technologies are expected to overpower the existing technologies? How is the regulations scenario further expected to impact the market? What will be the future product mix of the oil & gas processing seals market? What are the prime strategies of leaders in the oil & gas processing seals market? The study involved four major activities in estimating the current market size for oil & gas processing seals. Exhaustive secondary research was done to collect information on the market, the peer market, and the parent market. The next step was to validate these findings, assumptions, with industry experts across the value chain through primary research. Both top-down and bottom-up approaches were employed to estimate the complete market size. Thereafter, market breakdown and data triangulation were used to estimate the market size of segments and subsegments. In the secondary research process, various secondary sources such as Hoovers, Bloomberg BusinessWeek, and Dun & Bradstreet have been referred to, so as to identify and collect information for this study. These secondary sources include annual reports, press releases & investor presentations of companies, whitepapers, certified publications, articles by recognized authors, gold standard & silver standard websites, associations, regulatory bodies, trade directories, and databases. After arriving at the overall market size-using the market size estimation processes as explained above-the market was split into several segments and subsegments. In order to complete the overall market engineering process and arrive at the exact statistics of each market segment and sub-segment, the data triangulation and market breakdown procedures were employed, wherever applicable. The data was triangulated by studying various factors and trends from both, the demand and supply sides, in the oil & gas industry. This report categorizes the oil & gas processing seals market based on type, material, application, and region.